Am I a bit too obsessed with overalls? Possibly. I couldn't in a million years pass these babies up though. I thrifted them a while back at one of my favorite thift stores in Texas and have been dying to share them with you all. They are definitely the perfect spring-to-summer transitional piece. Anyway, I hope you all are having a great week! So cute, love the hat! You look very Parisiene chic! I've been loving overalls too! I'm tall though, so it's hard to find ones that actually fit! you and those overalls are absolute perfection! You are an absolute doll! eeep i need overalls! This is so cute! So cute! You look gorgeous! ok- that has to be one of the greatest thrifting triumphs in history. how cute! I'm always trying to scour thrift stores for vintage overalls, but new york is NOT the place to look, I tell you what. 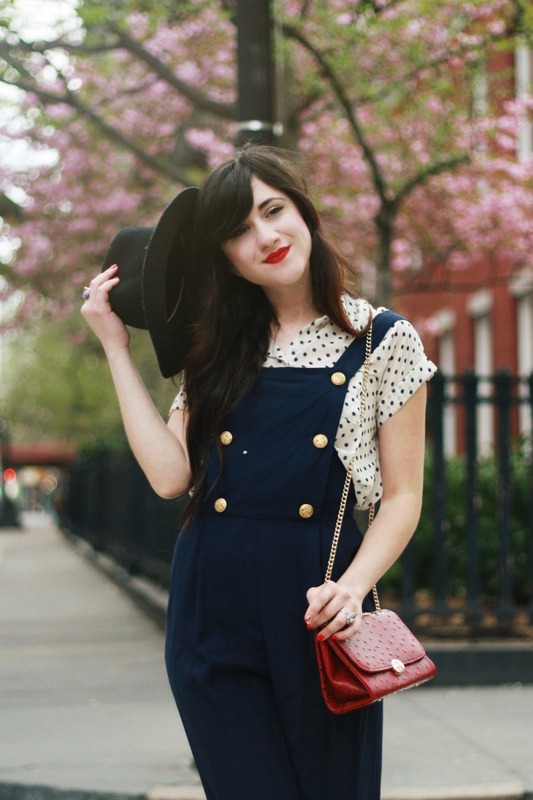 You have the most perfect collection of overalls! OMG u look so stunning! You seriously rock those overalls Bonnie! such a simple and sweet look! You look so adorable, I love it!! What a lovely little pair of overalls! You always look adorable. i'm in love with ur dungarees! such a cool look! Cute outfit. Your nautical themed overalls look comfy and your Urban Outfitters polka-dot blouse complements and contrasts with them nicely. Your hair and bright red lipstick look pretty as always. You can never be obsessed about overalls. I absolutely envy you for finding such cute ones! im glad you didnt pass these up, LOVE this!!! You are very pretty with your look!!! You look so pretty! Love this outfit! Overalls are the best! I saw an amaze pair in Zara the other day. The definitely give that whole vintage but modern feel. You want More updates about Latest Vehicles, Latest Top Cars, Latest Bikes, Latest Trucks, All Vehicles in One Website Now, Choose your car and get all info about the Vehicle with Pictures and Latest Prices in the world. the best outfit you´ve ever posted, Bonnie! I´m a little bit obsessed with your thrifted overall! i want to find overalls now! j'adore ce look, j'aime beaucoup le sac et les chaussures! j'adore les chaussures et le sac!!! I love your outfit! so cute <3 I need a pair of overalls asap!! I'd like to read this post, very helpful! Love this look! It is so cute! i love your style so much dear. We are the one who have development team behind Pakistan's largest media websites and who made wesbites which are busiest and most famous in Pakistan and very high ranking in Alexa and SEO point of view. love the shoes and hat !